After a bit of mid-winter break, those of us interested in all things health and economic get a belated holiday treat this week in the form of updated estimates from the National Health Expenditure Accounts. Included in this data series, but too often overlooked, are the federal government’s official estimates of governmental public health spending – now updated to 2012. Of course, we know the underlying data sources suffer from errors of omission and co-mission when it comes to defining and measuring governmental public health activity, but at least the data are longitudinally consistent – giving us reasonable metrics for tracking trends over time. Total governmental public health spending reached almost $75.0 billion in 2012, which in nominal dollars is about $1.7 billion more than in 2011 but still about $300 million below the nominal level in 2010. In constant dollars, however, 2012 public health expenditures were about 3.6% below the level in 2009 when using the GDP deflator. Factoring in the growing size of the U.S. population requiring health protection, public health spending stood at almost $240 per capita in 2012, about 5.5% lower than the 2009 level. As a share of total health expenditures, public health spending stood at 2.7%, the lowest level seen since 1988. As a percent of total GDP, public health spending is down 10.2% from its 2009 level. 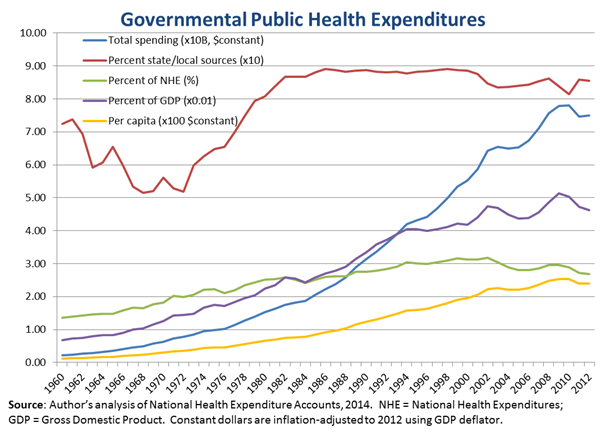 The lion’s-share of governmental public health spending derives from state and local government sources, as opposed to federal sources, as the red line in the figure above shows (be careful of the rescaling in this figure, and see my earlier post on this topic). The state and local share has edged up significantly in recent years, likely attributable in part to the expiration of federal stimulus funds for the short-lived Putting Prevention to Work initiative. Sequestration will be unkind to these estimates as well, as next year’s NHEA data will show. The big unknown centers on the future health and economic effects of stagnant and declining public health spending. Existing studies like David Grembowski’s, Paul Erwin’s, Tim Brown’s (which I posted about last month), and my own, suggest that if these diminished levels of spending persist, the adverse health effects are likely to be sizable. Moreover, a forthcoming paper (presented at the University of Michigan last year) suggests that, over time, diminished public health spending can lead to significantly higher levels of medical care spending. Perhaps most troublesome, some of our latest work presented recently at APHA shows that if these aggregate spending reductions are disproportionately concentrated in low-resource communities (and they probably are to some extent), the adverse health and economic effects are likely to be much larger. For those who don’t like these prospects, one can always quibble with the data. And this is a significant problem for research and for policy. The ugly truth is that a high degree of uncertainty surrounds our best estimates of public health spending. Public health administrators, policy makers, and the public at large need – and truly deserve – clearer answers to several basic questions of financing: how much does the nation currently spend on public health activities, who pays for these activities, and how are funds allocated and used across programs and population groups? Not to mention, we need better data to produce better science on the benefits and burdens of public health spending. I will take this up in a future post, so stay tuned. Thanks for the post, Glen. At the National Association of County and City Health Departments (NACCHO), through our Profile study and periodic capture of economic surveillance data, we’ve been following and reporting about these trends for local health departments. We’re also excited about PHUND$, a software system through which we are capturing more detailed revenue and expenditure data for local health departments while providing at the same time an opportunity for departments whose data are entered to conduct financial and ratio analysis. These analyses have proven useful to local health department leadership interested in benchmarking among self and others over time. This is common practice in non-governmental sectors. Ultimately PHUND$ holds promise to add a little more clarity and a little less uncertainty to the portion of the national estimates which, as you describe, are now fraught with multiple perils. Thanks for raising these points, Bobby. I shudder to think about how primative our understanding of governmental public health activities and resources would be without NACCHO’s data, analyses, and resources.